Good selection of an ornamental grass. 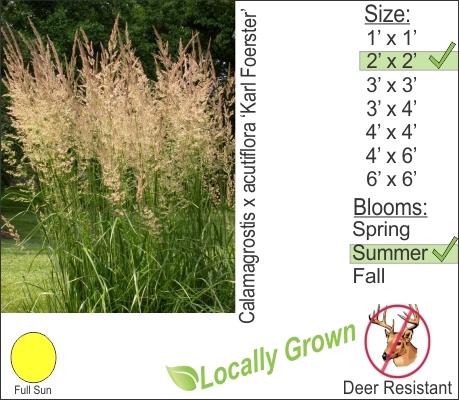 Karl Foerster Reed Grass produces Blooms by June in the Hudson Valley region outpacing other ornamental grass varieties. You can expect this clumping grass to get no larger than 2ft. and the plums reach typically 5ft. in height. in autumn you can expect a more reddish color color on the plumage. This plant is also deer resistant and due to the smaller size it will work well mixed into your perennial garden.